Our new families have often waited a long time for a place in the forest. They are excited for their children to be experiencing the freedom and time, fun and laughter and healthy, active life that our magical time in the forest inspires. Once their children are settled in, and are returning home tired, exulted and brimming with new discoveries and friends, parents remember to ask us, ‘how do you monitor learning and development?’. The first thing we answer is that the children are learning constantly. Almost every minute of their time in the forest is consolidating skills or learning. And they are active, happy and playing whilst doing so. We have many visitors to our forest, including recently the Faculty of Education from the University of Cambridge, who commented that our forest is a ‘remarkable’ setting with children (& adults!) more engaged in learning and activity than they have previously witnessed in schools or nurseries. Education experts note on visits to the forest how our children completely defy the myth that children only play alongside each other until they are at least 3 years old as they witness our 2 year olds in groups creating elaborate role play scenarios with purpose and intention. The personal, social and emotional development of our children, along with their communication skills are phenomenal. Learning to have empathy, learning to share, learning to teach, to have compassion, learning how to resolve conflict and create solutions to problems……these are all incredible skills for the children to hone every day and will serve them greatly throughout their lives. Enhancing life skills are a priority for us in the forest as we work to help our children acquire the skills to future proof them against a world we can’t even imagine yet. We don’t focus on the acquisition of knowledge through topics, or set curriculums, but instead follow the children’s lead in their play and individual passions to help them learn about the things that really interest them. Through this method of learning we have a 4 year old boy who explains to adults and peers rudimentary physics in explaining about centrifugal force (he enjoys being spun around the forest inside a tyre), a 3 year old boy who discusses the basic theory of relativity in sharing his observations and theories about gravity (he loves throwing pooh sticks into the river) and a 3 year old girl who explains what trajectory means (hitting targets with mud balls is a source of great amusement). We have children who through our game ‘arriba / abajo’ can add and subtract numbers 0-10 fluidly without putting too much thought into it. 4 year olds who play with multiplications. We have children who are writing elaborate and incredibly imaginative stories, with appropriate beginnings, middle and endings, speckled with vocabulary you wouldn’t expect from children of this age during our story scribing. We have 2 and 3 year olds who decide they want to play with a bow and arrow, go to find appropriate sized sticks and then use string to create their own props for their role play…often tying their own knots. We have 2 year olds who collect blackberries, then know how to mix them up to create a solution to tie-dye fabric. These children are incredible. So we know that children are learning and developing constantly, but how do we monitor this? Firstly, with very high staffing ratios of 1 adult : 4 children for all ages, often with a spare adult or two at the beginning and end of the forest day. Our high staffing ratios and small, mixed age groups allow our adults to know the children inside out. They know what makes the children come to life, they know what inspires questioning, they know what inspires laughter and they know where they need encouragement. We have an open door policy where parents are welcomed to come and talk to our educators about their child at any time. In fact it’s crucial that we discuss your child and your family situation frequently as we need strong relationships between nursery and home to be able to know the child the best and make the best provisions for him. 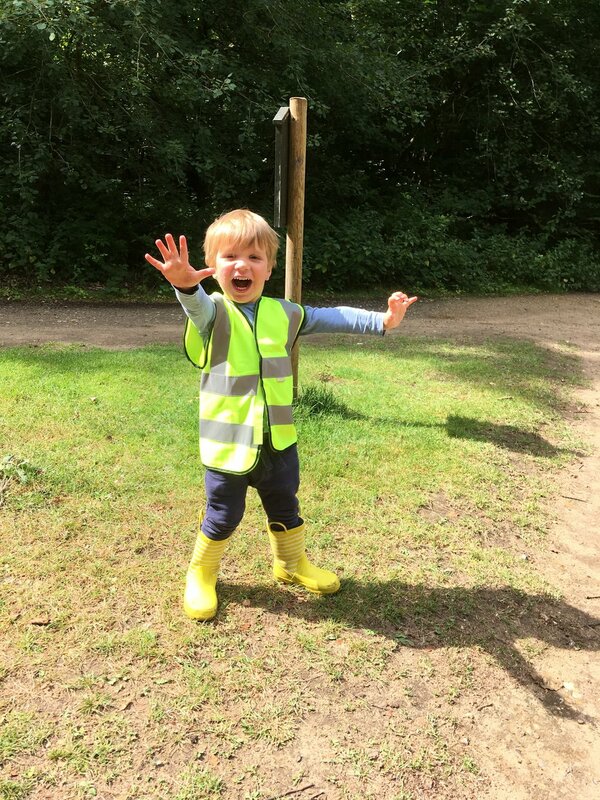 Whilst parents are at home or at work, we understand how you long to know what your little one is up to in the forest, so every day, we take a snap of them engaged in play and post it to your online portal to add a smile to your day and to give you something to use to discuss your child’s day with them when they get home. Parents are often amazed at their children’s capabilities in the forest. In addition to this we provide at least two formal observations and assessments of development per month. As we’ve mentioned, the children are learning constantly, but these observations and assessments are particularly wow moments, or moments of learning we’ve witnessed that really mean something to that specific child. These observations are photos or videos, accompanied by anecdotes of the moment and linked to the EYFS so you can clearly see the learning your child has demonstrated in this moment, along with the age bracket this learning takes place in. When we post both snaps of the day and also the more in depth observations and assessments, we welcome parent feedback and comments on these to enhance our understanding of the child even further. Finally, twice a year we host parent evenings in which we plan a detailed discussion of your child. We discuss every aspect of their learning & development - their life skills, their passions and interests, along with any concerns or any suggestions you have as to making their experience with us a better one. We furthermore complete in depth reports, which (is it wrong to be proud of this?!) often make parents cry. We know your children. We love your children. And we will do everything we can to help them develop into the best they can be, to allow them to transition to school happily and with the strength of character to succeed in everything they do. Newer PostBarnes - snail slime! Older PostBarnes - Forest Friendships!